ET3 or Evacuated Tube Transport Technologies is a transport system being pioneered by Daryl Oster, Michael Jordet, and Nick Garzilli who estimate that a system can be up and running in California by 2016. Once constructed, an ET3 line provides a super efficient alternative to traditional rail and subway transport systems accept that is has the availability and convenience of a Taxi. These systems provide an inexpensive way to transport goods and passengers and have the potential to gain up to ninety percent of the market share in the transport and shipping industry. ET3 is cleaner, cheaper, faster than other transportation systems. It eliminates pollution from vehicles because it is entirely electric. On top of that, an ET3 system does not interfere with environment and it could be set up without damaging any wildlife habitats that it runs through. There is also no need to keep the tracks clear of snow and vegetation because they are entirely self contained. In addition to passengers and package shipments ET3 lines can also be used to route internet and power and internet lines. A row solar panels could also be run along the top of the tube which would provide more than enough power for the ET3 system, essentially turning it into its own power station for the surrounding areas. "ET3 can provide 50 times more transportation per kWh than electric cars or trains [and] can be built for 1/10th the cost of High Speed Rail, or 1/4th the cost of a freeway." The factors that make ET3 so efficient are that its light weight capsules allow quick construction. The systems efficiency comes from each capsule riding magnetically suspended in a tube that has had the air sucked out of it to reduce friction. This system is basically an incarnation of an age old physics experiment in which a feather and a pebble of equal weight are dropped from an equal height. The pebble always falls at a faster rate unless the items are dropped in a vacuum, in which they will fall at the same rate due to the absence of air to resist their movement. This simple physics experiment also shows the ET3 will be able to reduce the speed of its transport cars. 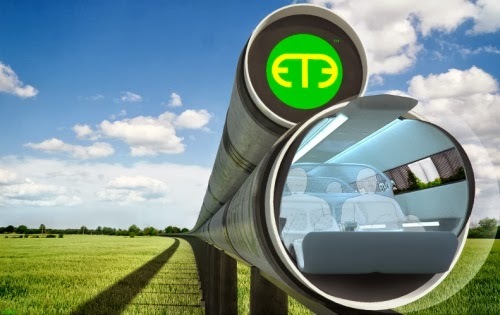 By allowing air into a section of the tube the ET3 can efficiently begin to slow the transport car in preparation for allowing it to be unloaded. The ET3 reveals an amazing advance in transportation technology that will save time, eliminate traffic and revolutionize shipping. The system will provide individual transport pods for passengers. The pods will be about the size of a regular car and will be able to hold several people at the same time. Another advantage that this system will provided is due to how quickly it can get passengers from one place to another. In the cases of an emergency or a natural disaster it could greatly reduce evacuation times saving many lives. In the event of an emergency on the track its self, gate valves could re rout traffic and close off sections if needed. TEDx Talk in ET3 here. Fantastic TEDx talk. Mind if I ask if you have any plans to do any more of them? Thank you! I would love to do more. I have also talked to Daryl about doing a University tour! There's a chance you're qualified for a new solar energy program.